Scar Repairex® Ultra cream is formulated specially to treat acne scars, burns, keloids & to reduce old, resistant scars in Asian, African & Ethnic skins. Scar Repairex® Ultra is excellent for use in plastic surgery too, as it promotes rapid healing before scarring occurs, leaving a smoother & healthier skin. 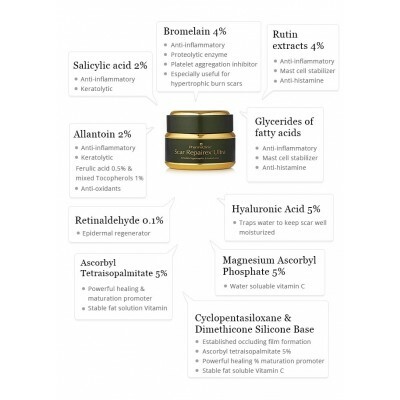 Scar Repairex® Ultra contains Professional Strength Actives to promote rapid healing, with minimal scarring, which is essential in acne scar treatment & to flatten keloid scars. Independent trials have shown 60% reduction in scaring over a 12-week period. 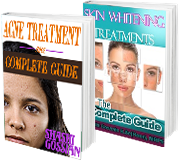 Even after suffering for many years with scars, you can now regain a much smoother & clearer skin! 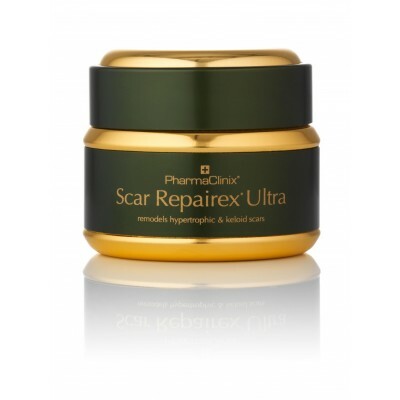 Scar Repairex® Ultra is the ONLY choice of treatment for particularly stubborn scars. Scar Repairex® Ultra is a high strength silicone cream that seals the scar with a transparent micro-film, thereby providing maximum hydration & occlusion to encourage healing & discourage scarring. The high strength anti-inflammatory agents reduce the scarring stimulus, causing the injured dermis to heal. Q: How do I treat holes in my face due to Acne like ice-pick scars? A: Holes in the skin occur after Acne because the skin is being pulled by fibrosis. No creams can release these adhesions and dermarolling is the best method of cutting these tough fibres. For best results, the skin should be rolled over on alternate nights with 0.5mm Demarollex® and Scar Repairex® Ultra applied twice daily.